A trip to the Emerald Isle awaits online slots players now as we check out this mystic release from 2By2 Gaming; it’s called Celtic Goddess and she’s here to offer us upgraded symbols and free spins – keep reading to find out more. 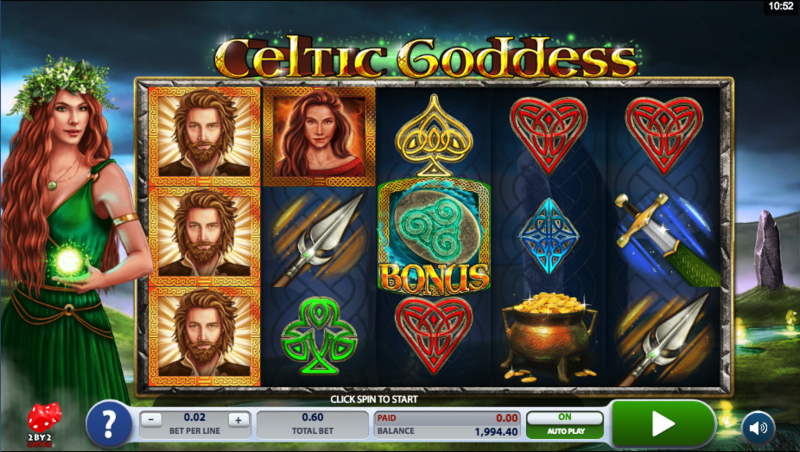 Celtic Goddess is a five reel slot with three rows and thirty fixed paylines; a delicate frame carved from stone borders those reels while our eponymous deity stands to the left, glowing green thing in hand. The higher value symbols are the male and female characters from this story, a pot of gold, a menhir, a sword and a spear; coloured playing card symbols in Celtic designs represent the lower values. The goddess is of course wild, she appears only on reels two and four and she will substitute for all others to help form winning combos except for the bonus symbol. A win with one wild will be multiplied by 2x and a win with two wilds will be multiplied by 4x. This is triggered randomly on any spin and the goddess will transform all lower value playing card symbols into one higher value symbol; the reels will then be re-evaluated for any wins. 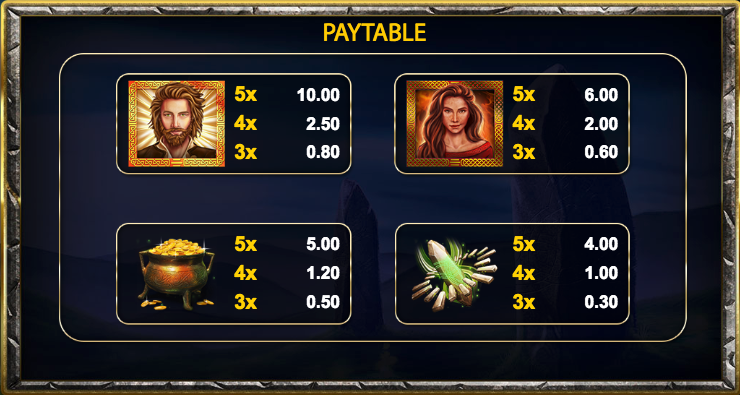 Trigger this by landing three, four or five of the bonus symbols anywhere in view for which you will receive 8, 12 or 16 free spins respectively; the spins unfortunately can’t be triggered again but after each spin the Goddess Feature will activate which should result in some pretty big wins. There’s a nice atmosphere to Celtic Goddess and a jaunty Irish soundtrack to accompany the spinning reels; the Goddess Feature and the free spins seem to hit regularly and there’s an RTP of 96.02%.